The Inhabitable Skin is an innovative exploration of materials and manufacturing processes that results in a three dimensional form that exists as an independent monocoque structural assembly. The formal expression of the skin is driven by the necessity of structure, environment and context, but ultimately it bends to the will of the designer who is capable of controlling it. The exciting prospect for a designer is the ability to explore form, but within a framework of definitive influences towards an architectural end. For the engineer, the Inhabitable Skin represents a revolution in structural morphology, an exploration of structural form not constrained by linear and planar elements but a combination of complex surfaces. The concept of the Inhabitable Skin offers the potential to revitalize and re-energize densely populated urban centers. It focuses on existing masonry clad highrise buildings and takes advantage of the inherent strength of their structural systems. The Inhabitable Skin is a three dimensional lightweight composite cladding system that directly replaces the existing masonry veneer. The difference in self weight between the two systems represents the opportunity for inhabitation. In essence, the lightness of the composite skin allows for an extension of the floor plate to support additional live loading. The skin and floor extensions are fabricated with Polymer Matrix Composites and act together as an ultra efficient singular monocoque structure. The structural premise of the Inhabitable Skin relies on the reloading of the edges of the existing structural slabs in exactly the same manner as the masonry veneer that was removed. This allows the skin to act as a kind of cocoon that can be attached to the existing building’s exterior without relying on a separate supporting structure or adversely impacting the building’s existing gravity or lateral load resisting systems. The opportunity for such an application in urban communities is surprisingly abundant. Each opportunity offers its unique set of influences to the visual character or language of the skin based on context, building orientation, materials, massing, etc. Some of the most evident opportunities exist on the facades of highrise buildings adjacent to much shorter buildings. In these cases, the existing building façade is limited by the potential of the shorter building to be replaced by much taller building. The façade is therefore unable to respond directly to its context but rather to its potential context. The Inhabitable Skin concept allows the building’s skin to operate on a shorter life cycle than the core of the building and therefore the building’s exterior can more dynamically react to its local conditions. This current evolution of the concept focuses on masonry clad highrise buildings in Manhattan and suggests a formal response through a case study of an existing building located in midtown. This specific building was chosen because of its prominence in the midtown Manhattan skyline as well as the amount of masonry on its façade with a clear southern exposure. 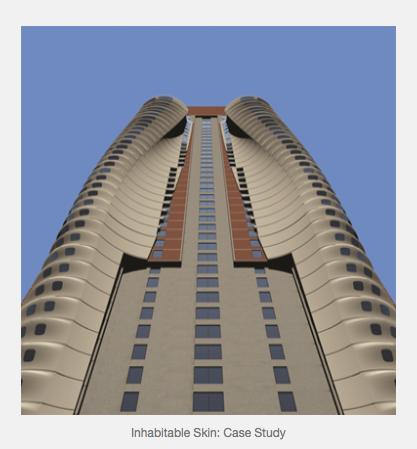 This coupled with the fact that it is a residential highrise building, offered a compelling scenario for intervention with some clear design influences and constraints. Below is a set of before and after images of the conceptual design for an Inhabitable Skin. The form of the Inhabitable Skin in this case study is driven by the necessity to create a structurally cohesive form influenced by its environment. The direct southern exposure of the façade challenges the skin to respond as a passive solar shading device to reduce the thermal heat gain potential of direct sunlight into the interior spaces. Therefore, the symmetric forms of the skin on either side of the existing windows blocks early and late day sun and the rippling in the surface creates passive shading at each floor level for direct midday summer sun. The form of the Inhabitable Skin is constrained by the extents of brick masonry on the façade as well as the location of program on the interior of the building. The effectiveness of the solar shading as well as the creative freedom enabled by composite materials is evident in the rendering below. 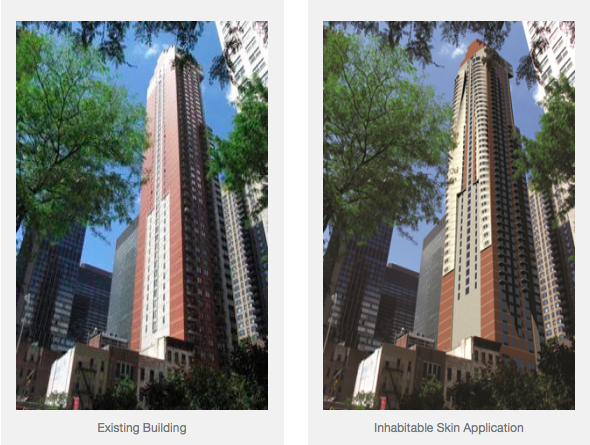 This specific skin design solution extends the floor plates up to 10 feet from the existing face of the building and adds more than 11,600 square feet of rentable floor area to 36 stories of an apartment building. Polymer Matrix Composite materials have been around for many decades but concerns regarding their UV stability, fire resistance and sustainability have limited their impact on the building industry. This case study specifically addresses these issues through an innovative layering of materials. The composite structure of the panel is fabricated with a protective exterior coating of high density ceramic concrete as well as a lightweight fire resistant ceramic concrete interior coating. The layering of these materials to perform their individual but complementary tasks creates a highly efficient and lightweight system which reduces the overall energy footprint in fabrication, delivery and on site construction when compared to traditional methods of façade replacement. This concept will be presented for the first time at the Innovate: Integrate – Building Better Together exhibition at the New York Center for Architecture. The exhibit opened on October 6th and runs until mid-January.